Bet Eagles-Giants over 43.5 with 888Sport. Bet total TDs over 4.5 at -129 with Karamba. Bet on Sterling Shepard getting more than 55.5 receiving yards at -134 with 888Sport. For the first time since the 2016 season, the Eagles (2-3) are riding a two-game losing streak and are under .500. They didn’t lose their third game last year until Dec. 3. But falling to the Titans and struggling Vikings in consecutive weeks, combined with another starter going on injured reserve, has the defending Super Bowl champs spiraling downward and threatening to bottom out quickly. There isn’t an easy answer for Doug Pederson’s squad. Uncharacteristic offensive line breakdowns, drops, penalties and blown coverages have all surfaced at the wrong time. You can make an argument that with some cleaner execution the Eagles would be 5-0. You can also argue that with some cleaner execution by opponents the Eagles could be 0-5. Pederson needs to get his offense going. The Eagles rank just 25th in points scored and 20th in yards after placing third and seventh, respectively, last year. A new coach, new defensive scheme and new contract for their best player hasn’t helped the Giants escape their losing ways. They lost a heartbreaker to the Panthers on Sunday, 33-31, on Panthers kicker Graham Gano’s 63-yarder as time expired. Even with the hiring of head coach Pat Shurmur, upgrading of the offensive line and securing Odell Beckham to a long-term deal, the Giants (1-3) remain offensively challenged. Three times they’ve scored fewer than 20 points per game, although 31 against the Panthers perhaps resembled a small step forward. Defensively, they’ve been terrible against the run and rank 31st in sacks per pass attempt under new coordinator James Bettcher. Another week, another impact player for the Eagles placed on injured reserve. A torn ACL will sideline running back Jay Ajayi for the rest of the year. Ajayi joins safety Rodney McLeod, wide receivers Mike Wallace and Mack Hollins and tight end Richard Rogers as significant players on IR. Two of them can return but Ajayi won’t be one. Fortunately, running back Corey Clement (quad) is expected to play Thursday night after not playing each of the past two games. 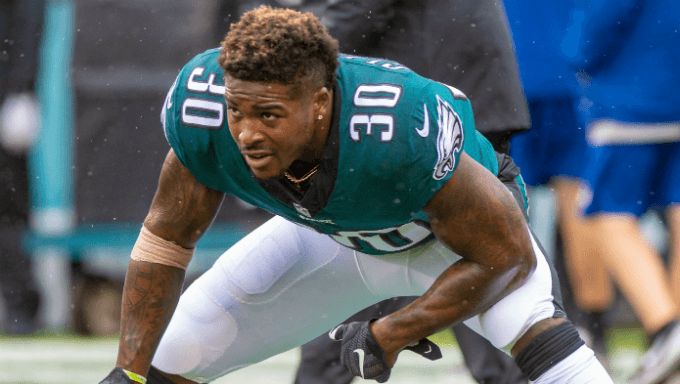 He and Wendell Smallwood will anchor the ground game as the team nurses Darren Sproles back from a hamstring injury. The Giants are hoping kicker Aldrick Rosas (quad) can play, or else they’ll have to promote Marshall Koehn from the practice squad. Speedy tight end Evan Engram is battling a knee issue that’s sidelined him for two games, but he’s hoping to play. Pro Bowl edge rusher Olivier Vernon also hopes to play after missing the first five games with a high-ankle sprain. Even if he plays, it’s unlikely Vernon will play all snaps. The line is at 43.5 with 888Sport, and an Eagles game this year has failed to produce at least 44 points just twice, once with Nick Foles starting and once with Carson Wentz making his debut. The Eagles have their scoring problems, but they’re getting a big help with the return of Clement. Their offensive line has struggled to protect Wentz but the Giants haven’t generated much of a pass rush this year. As for the Giants, recent history suggests that they’ll have trouble putting points up, but they play differently against the Eagles. Their two highest scoring totals last year – 29 and 24 points – came in games against the Eagles. The Giants totaled 53 points and 919 yards in two games against the Eagles last year, somehow losing both games. The total points for those games were 63 and 51. It’s not likely both teams will combine for more than 50 on Thursday, but history suggests more than 43.5 is feasible. Bet it at 888Sport. The over/under total is set at 4.5 with Karamba, and even with two struggling offenses, there’s enough firepower on the field to figure on at least five total TDs. These two NFC East rivals generally play high-scoring games against each other, combining for 14 TDs in last year’s series and 10 in 2016. Both teams are in the bottom 10 of the league in allowing pass plays of at least 20 yards this year, so look for both quarterbacks to have better success stretching the field than they’ve had this season. Back more than 4.5 total TDs at -129 with Karamba. In four career games against the Eagles, Giants slot receiver Sterling Shepard has averaged 96 receiving yards per game against them on seven catches. Last year, Shepard went over 130 yards against the Eagles in both games, with a 7-for-133 effort followed by 11-for-139. It’s not coincidence. Under Jim Schwartz, the Eagles play soft coverage and give receivers between 8-12 yards of cushion because Schwartz plays so much single-safety coverage and wants to give his corners some room. The Giants have typically attacked the Eagles with a bevy of three-step drops aimed to both diffuse the Eagles’ pass rush and to set up slant-and-go routes after the corners get adjusted to the short passing game. Eagles slot corner Sidney Jones has had some rookie miscues and poor tackle attempts, so there’s always a chance for Shepard to break one. Another corner, rookie Avonte Maddox, is filling in at safety and is also asked to cover the slot in certain formations. Bet on Sherpard getting more than 55.5 receiving yards at -134 with 888Sport.